They do not ship outside of the US. yeah I get the alerts, might be able to give a recommendation or two but yeah I can't ship over there. There must be another cory here, that profile isn't mine. I have a Denon AVR4300H - same model as yours but a little older (1 or 2 years) - and have RP8060FA's connected as fronts. The RP8060FA is a RP8000 but with an Atmos module build in. My experience is exactly the same as yours, the speakers sound flat, lifeless and lack bass (you use a subwoofer so you might not notice the lack of bass so hard). After connecting an external amplifier the speakers came to life. That external amplifier has a smaller (but similar) power specification at 8 Ohms compared to the Denon but can power speakers with impedances down to 2,7 Ohm. (the amplifier is a XTZ Edge A2-300 - class D ICEpower). I cannot find impedance charts for the new RP8000/8060FA yet but the older model RP280 had impedance dips to 3,1 Ohms. I suspect that the Denon is not capable to power a RP8000/RP8060 properly because of the impedance dips of the speakers i.e. there is sufficient power for 8 ohms but the amplifier cannot generate enough current when the impedance drops. Although I like the Denon for all its functionality, the audio part seems to be lacking. I would suggest that you borrow a few amplifiers from friends or willing shops and evaluate the RP8000 with those before changing your speakers. The sound quality difference was immediately obvious in my case. Are you planning to add a external 2 channel power amp? May be 200w/ch will it make any difference? What other amps you tried? Yes, that XTZ amplifier is connected permanently to the pre-out of the Denon AVR4300H as external power amp powering my 2 front speakers. (it was my intention to build a 7.0.4 Atmos speaker lay-out, this requires an external amp with the AVR4300 as such I had ordered the amp at the same time as the RP8060FA speakers). I have not tried another amp yet. The power specification is not the main issue - even 50W/channel can be sufficient - but the amplifier must be able to provide sufficient current when the impedance is low or complex. 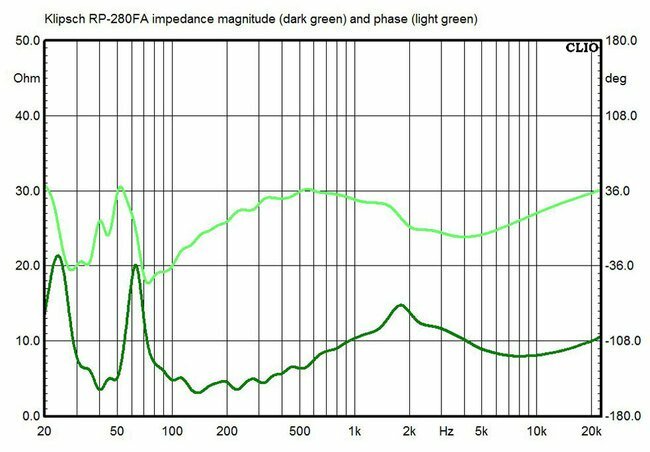 As you can see in the graph above (dark green line) a speaker presents different impedances in function of the frequency and some amplifiers have difficulty driving speakers with low impedance dips. A rule of thumb to asses the ability of an amplifier to drive low impedances is to look at the power spec at 8 and 4 Ohms (and even better if lower impedances are specified). A stable amplifier wil show double the power from 8 to 4 Ohms for example 100W/ch at 8 Ohms and 200W/ch at 4 Ohms. In case of the AVR4300H one can find the following spec in the manual: 130 W x 2-channel (8 Ω/ohms) and only 190 W x 2-channel (4 Ω/ohms) in stead of the expected 260 W at 4 Ω/ohms. This indicates that the amplifier does not like lower impedances. As the older comparable speaker model RP-280FA dipped to 3.1 Ω/ohms this presents an even more difficult impedance for the AVR4300 amplifier. Alternatively you could consider to buy and try an inexpensive Chinese class D amplifier (<100$) as generally these are quiet good with low impedances.